Topology Eyewear reserves the right to review these Terms to make sure they accurately reflect developments in current law and our business operations, and to update and revise these Terms at any time. We’ll make sure to also change the “Effective Date” at the top of this page so you can tell if these Terms have changed since your last visit. Please review these Terms regularly because once we post any changes, your continued use of the Services constitutes your acceptance of the revised Terms. We only permit individuals who are at least 18 years old and can form legally binding contracts with us to use the Services. However, if you are under 18 years old and would like to use the Services, you can, but only if a parent or legal guardian who is at least 18 years old supervises you. In such cases, the adult would be the user and is responsible for any and all activity. We offer the Services only for personal, noncommercial use, unless you have received explicit authorized permission in writing from Bespoke, Inc. Some of the Services are not available without creating a user account (”Account”). If you create an Account, you are solely responsible for any activity that occurs through your Account. In order for us to provide you the best possible service, you agree to provide us with complete, accurate, and updated information for your Account at all times. If any information is incorrect or outdated, it can lead to errors or delays, for which we will not be responsible.This is especially important if you place an order, because we need to be able to communicate with you about it as it moves through the stages of production.Whichever email address you use to set up your account, please ensure it is an email address you check. You should not share your Account information. It may include access to your orders, Personally Identifiable Information (PII), and information about your vision prescription.Sharing your credentials with someone else constitutes granting of permission to Topology to share your PII and your vision prescription with that individual.You may never use another person’s Account or registration information for the Services without permission. Similarly, no one else should be able to use your Account without permission. You are solely responsible for keeping your Account and Account password secure and for any consequence resulting from your failure to do so. You should never publish, distribute, or post login information for your Account. If you delete the app, it will no longer be associated with your account, but your account will not be deleted.In order to re-associate your app with your account, re-install the app and again enter the same email address upon launch.If you delete and re-install the app, you may not have access to previously-recorded face models.If you wish to completely delete your account, you can contact us through the app or email us at hello@TopologyEyewear.com. 1. Scan yourself. Using the app, take a video of yourself as directed by the instructional video and in-app guidance.For best results, choose a well-lit location but minimize direct sunlight or spotlight to avoid shadows on your face.When the processing is complete, the app will automatically download and install the face model so that you can select it from the home screen and use it in a virtual fitting. 2. Design your frames. 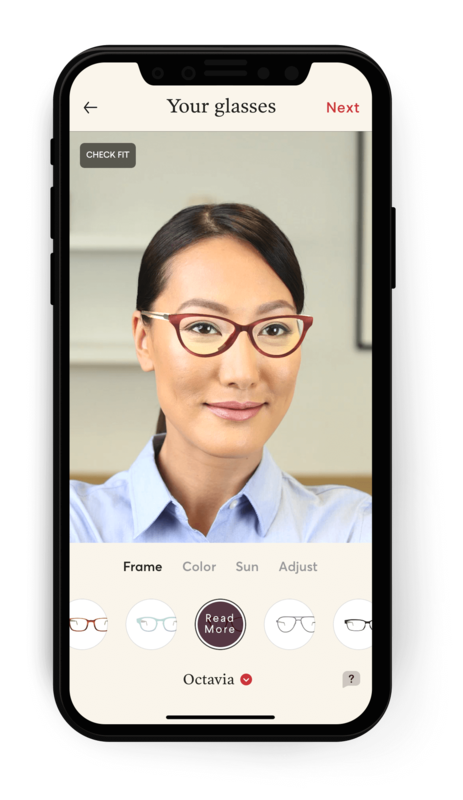 With the intended purchaser’s face in in the try-on view, select the style, color, tint, and fit parameters you want to create the eyewear you desire.Tap the price icon in the top right of the screen to enter “check-out”.Do not style an order for one customer using another person’s face in the virtual fitting. 3. Select prescription type. Depending on your vision correction needs, Topology can offer plano, single vision, progressive, and bifocal lenses.We do not typically offer tri-focal lenses or other types of vision correction, but if you have a specific need, please drop an email to inquire.Types of vision correction will impact the price. 4. Select relevant lens filters.Topology offers a range of additional filters you would like in your lenses. Note that options you select in this screen may impact the total price. Tinted or mirrored lenses can be polarized.Clear lenses can come with a blue-light-blocking filter or a transition (photochromic) filter. 5. Enter an inscription. We will engrave an inscription of your choice on the inside of the temple of the frames.Please ensure the inscription is correct. 6. Payment. After you have made your frame design and lens selections, you will see a prompt for your payment details, your shipping information, and any promotional codes or gift card information you may have. By entering your payment information and submitting your order, you authorize us to charge the amount of the order to your selected payment option. 7. Post-Checkout.Topology will charge your card, and ask you to submit a scale recording and your prescription information.We will not begin production of your frames until both of these are completed.If we do not receive both the scale recording and the prescription within 30 days, Topology may, at its discretion, cancel the order and refund your money. 8. Submit your scale recording through the app. You can find the option to submit this calibration video on the “About” screen, which you find by clicking on the bottom right of the Home screen. The app will guide you through the scale recording like it did through your original selfie video. c) uploading an image of your prescription through the app. Please note that your prescription must be valid on the date you place your order. If your prescription does not include an expiration date, we will fill your order in accordance with applicable legal requirements or within two years of the date of the prescription. If your prescription or order information is incomplete, we may need to take additional measures to track down current information, which could mean you have to wait longer for your glasses.Topology cannot fill all prescription types.If you need a specialized order (e.g., minus power stronger than -10.0 or plus power stronger than +6.0, prism correction, etc. ), or you have strabismus or an eye-muscle imbalance, Topology highly recommends you work with a local optometrist or ophthalmologist to best serve your needs.Topology reserves the right to cancel an order and refund a customer’s money upon receiving their prescription if it determines that the customer’s vision correction needs are better served by a local Eye Care Professional. 10. Delivery Information: We’ll need your name, address, and telephone number to send you your prototype and your final custom eyewear. All orders are shipped to the 50 United States and Puerto Rico for free.Once prescription and scale recording are submitted, you will receive a prototype within 3-4 days.Once you confirm the fit of the prototype, you’ll receive your finished glasses in 3 weeks. 11. Checking Order Status: While your order is in production, you will receive updates about its progression through our production and finishing process.Any any time, you can email us at hello@TopologyEyewear.com or chat with us through the app to check the status of your order. 12. Risk of Loss: The risk of loss and title for all products you order passes to you upon our delivery to the carrier (such as FedEx, UPS, or USPS). 13. Returns and Exchanges. If for any reason you are unsatisfied with your glasses, we will gladly attempt to remake them to suit you better, or we will provide a full refund, as long as you notify us of your intent to return the glasses within 30 days of receiving the glasses, AND you return the glasses completely intact.Contact us at hello@TopologyEyewear.com to request a refund or exchange. Manufacturer’s warranty. We will repair minor scratches to the frame or damages to the hinge from normal use within a year of delivery, at our expense.Contact us at hello@TopologyEyewear.com for details. Lost or damaged product. If the frames break, the lenses are are broken or scratched, or if the glasses are lost within 90 days of delivery, Topology will repair or replace the eyewear (same design, same prescription) at a significant discount, depending on the type of repair or replacement required. 15. Access to your Prescription. We keep your prescription on file for some time after you order your glasses, and we make that information available to you upon request. We will respond to your request as quickly as possible, but be aware that it could take us a day or two to retrieve older (say, dated more than two years ago) prescriptions. Please keep that in mind if you need your information by a certain day or time. 16. Insurance. Topology is considered an out-of-network provider for vision insurance, which means you can absolutely use your vision insurance to partially reimburse the cost of glasses as long as you haven’t used it to purchase another pair of glasses or supply of contact lenses in the last year.After you complete your purchase and provide your prescription, please email hello@TopologyEyewear.com if you’d like help filing a claim for your reimbursement check.For Insurers offering an Assignment of Benefits option (as of this writing, that’s VSP and Cigna Vision), we will offer an up-front discount of 20%, conditional upon our ability to file a claim on your behalf for reimbursement.If you fail to provide Topology with the information needed to file a claim, or if your vision insurer informs Topology that you are not eligible for a spectacle frame and lens benefit, Topology reserves the right to invoice you for the balance of the order amount, and withhold delivery of the glasses until that amount is paid. 17. Purchase Limits. We want to give all our customers an opportunity to buy our glasses. Therefore, we do not authorize the purchase of commercial quantities of our glasses, and we may place limits on purchases. We may also, among other things, restrict orders placed by or under the same customer account, the same credit card, and/or orders that use the same billing and/or shipping address. We reserve the right to limit, cancel or prohibit orders that, in our judgment, appear to be placed in violation of this policy. We further reserve the right to cease doing business with customers who violate this policy and any other parts of our Terms. 18. Language. Presently, our order process only supports the English language. All of the content that appears on the Services, including without limitation all designs, illustrations, icons, photographs, video clips and written materials, as well as the compilation of the website, Services, and other materials, are the exclusive property of Topology Eyewear or our licensors and is protected by United States and international copyright laws. All trademarks, service marks, and trade names that appear on the Services and the overall “look and feel” of the Site and Services (collectively the “Marks”) are proprietary to Topology, or the respective owners of such Marks. You may not display, reproduce, or otherwise use the content or materials on the Services, including the Marks, without first receiving written consent from us. You may not remove or otherwise modify any legal or trademark notices from any content we make available through the Services. Scraping the Services or using other automated or manual means to take our content without our prior consent is expressly prohibited. Any unauthorized use of any content or materials on the Services is strictly prohibited and violates copyright, trademark, and/or other intellectual property laws, and/or the laws of privacy, publicity, and/or communications regulations and statutes. If you would like to request authorization to use the materials or content on the Services, please contact us at hello@TopologyEyewear.com. We grant you a limited, non-exclusive, non-sublicensable and non-transferable license to use (i.e., display locally) the Services solely for personal, non-commercial, use. This license will allow you to use and enjoy the benefit of the Services as we provide them, in the manner we permit through these Terms. This license only grants you the rights we expressly stated in this section. Resell or make any commercial useof the Services or any of the Service content;modify, adapt, translate, reverseengineer, decompile, disassemble, or convert into human readable form anyof the Service content not intended to be so read, including using ordirectly viewing the underlying HTML or other code from the Servicesexcept as interpreted and displayed in a web browser;copy, imitate, mirror, reproduce,distribute, publish, download, display, perform, post, store, or transmitany of the Service content, including without limitation any Marks, in anyform or by any means, including—but not limited to—electronic, mechanical,photocopying, recording or otherwise;use any manual or automatedsoftware devices or other processes (including data mining, bots, spiders,automated tools or similar data gathering and extraction methods) to“crawl” or “spider” any page of the Services or to collect any informationfrom the Services or any user of the Services; orharvest or scrape any content fromthe Services. Occasionally, you may see areas on the Services where you can post information or communicate with us or other users. We hope you will use these tools to meet the rest of our community and give us your feedback. These areas may be in the form of social media posts, bulletin boards, chat rooms, comment areas, billboards, forums, news groups, postings sections or similar communications facilities. You will keep all ownership or license rights in your User Content (as defined below), including the right to grant additional licenses to your User Content. There are no restrictions on your ownership and license rights in your User Content unless you otherwise agree in writing. However, when you provide your User Content to us, you are explicitly granting us license to use it, as outlined below. When you submit, distribute, transmit, or post any communications or any other material to Topology (either through the Services, or through our pages on third party sites, such as Instagram, Twitter and Facebook), this is collectively “User Content”.However, User Content specifically DOES NOT INCLUDE the selfie scans uploaded to our servers used to create your virtual fitting session and the scale recording used to calibrate fit.It further does not include the contents of private conversations you have with Topology customer support.Sharing of User Content gives us a right and license to use, copy, reproduce, process, adapt, modify, publish, transmit, display, and distribute your User Content in any and all media formats or distribution channels. You agree that this license includes the right for Topology to use your User Content to provide, promote, and improve the Services. You agree that this license is irrevocable, non-exclusive, perpetual, worldwide, transferable, sublicensable, fully paid, royalty-free, and will survive termination of your Account. Please note that we may use User Content without compensation of any kind to you, including if we use User Content for advertising or promotional purposes. In addition to giving Topology a license, you also give each user of the Services an irrevocable, non-exclusive, perpetual, worldwide, transferable, sublicensable, fully paid, and royalty-free right and license to access your User Content through the Services and to use, edit, modify, publish, reproduce, distribute, prepare derivative works of, display, perform, adapt, and promote such submissions, including after any termination of your Account. The bottom line is that if you share something with us beyond the two videos required to place an order, your customer service conversations, or your vision prescription, you keep ownership of it and can continue to do anything you want with it, but you allow us and our other users to use your User Content as we see fit. If you don’t agree to these conditions, then please don’t provide the materials to us. you hold all necessary right,title, and license to such materials;that your submission of suchmaterials to Topology does not and will not violate or infringe the rightsof any third-parties, including without limitation, any privacy rights, publicityrights, copyrights, trademarks, contract rights, or any other intellectualproperty or proprietary rights; andall User Content you provide isaccurate, complete, up-to-date, and not misleading. include any profanity or obscene,indecent, or pornographic material;contain any unauthorized orunsolicited advertising, such as spam;contain software viruses or anyother computer codes, files, or programs that are designed or intended todisrupt, damage, limit, or interfere with the proper function of anysoftware, hardware, or telecommunications equipment or to damage or obtainunauthorized access to any system, data, password, or other information ofours or of any third party;impersonate any person or entity; orinclude anyone’s identificationdocuments or sensitive financial information. You may see a lot of different content on the Services. Some of this content will come from other users or sources outside of Topology. All content, including User Content and third-party content, is the responsibility of the party that creates it. Topology does not control or endorse any User Content or third-party content, and we make no claims or representations regarding any content we do not create. We may provide links to third-party sites or resources, but these links do not mean we endorse or have any associations with the third parties. Please note that any moderators, forum managers, or hosts on the Services are not authorized as our spokespersons, and their views do not necessarily reflect those of Topology Eyewear. We take no responsibility related to third-party content, User Content, or any actions resulting from your use of any part of the Services. Topology will have no liability in connection with any content submitted to, transmitted via, or displayed or posted on or through the Services, regardless of whether Topology or another party provides it. which users access the Services;what content you access via theServices;what effects the content may haveon you;how you may interpret or use thecontent; orwhat actions you may take as aresult of your exposure to the content. 3. THE SERVICES ARE PROVIDED “AS IS” AND WITHOUT WARRANTY OF ANY KIND. TO THE MAXIMUM EXTENT PERMITTED BY LAW, TOPOLOGY DISCLAIMS ALL REPRESENTATIONS AND WARRANTIES, EXPRESS OR IMPLIED, RELATING TO THE SERVICES OR ANY CONTENT ON THE SERVICES, WHETHER PROVIDED OR OWNED BY TOPOLOGY OR BY ANY THIRD PARTY, INCLUDING WITHOUT LIMITATION WARRANTIES OF MERCHANTABILITY, FITNESS FOR A PARTICULAR PURPOSE, TITLE, NON-INFRINGEMENT, FREEDOM FROM COMPUTER VIRUS, AND ANY IMPLIED WARRANTIES ARISING FROM COURSE OF DEALING, COURSE OF PERFORMANCE, OR USAGE IN TRADE, ALL OF WHICH ARE EXPRESSLY DISCLAIMED. IN ADDITION, TOPOLOGY DOES NOT REPRESENT OR WARRANT THAT THE CONTENT ACCESSIBLE VIA THE SERVICES IS ACCURATE, COMPLETE, AVAILABLE, CURRENT, FREE OF VIRUSES OR OTHER HARMFUL COMPONENTS, OR THAT THE RESULTS OF USING THE SERVICES WILL MEET YOUR REQUIREMENTS. TO THE FULLEST EXTENT PERMITTED BY APPLICABLE LAW, IN NO EVENT WILL TOPOLOGY OR ANYONE REPRESENTING TOPOLOGY BE LIABLE TO YOU UNDER CONTRACT, TORT, STRICT LIABILITY, NEGLIGENCE OR ANY OTHER LEGAL OR EQUITABLE THEORY, FOR (A) ANY LOST PROFITS, DATA LOSS, COST OF PROCUREMENT OF SUBSTITUTE GOODS OR SERVICES, OR DIRECT, INDIRECT, INCIDENTAL, SPECIAL, PUNITIVE, COMPENSATORY OR CONSEQUENTIAL DAMAGES OF ANY KIND WHATSOEVER RESULTING FROM: (I) YOUR ACCESS TO, USE OF, OR RELIANCE ON ANY CONTENT PROVIDED THROUGH THE SERVICES OR ANY ERRORS OR OMISSIONS IN ANY CONTENT; (II) ANY UNAUTHORIZED ACCESS TO OR USE OF THE SERVICES OR TOPOLOGY’S SECURE SERVERS AND/OR ANY AND ALL PERSONAL INFORMATION AND/OR FINANCIAL INFORMATION STORED THEREIN; (III) ANY INTERRUPTION OR CESSATION OF TRANSMISSION TO OR FROM THE SERVICES; OR (IV) ANY BUGS, VIRUSES, TROJAN HORSES OR THE LIKE THAT MAY BE TRANSMITTED TO OR THROUGH OUR SERVICES BY ANY THIRD PARTY (REGARDLESS OF THE SOURCE OF ORIGINATION) OR (B) ANY DIRECT DAMAGES IN EXCESS OF (IN THE AGGREGATE) OF THE GREATER OF (I) FEES PAID TO US FOR THE APPLICABLE PRODUCTS; OR (II) $500.00. THESE LIMITATIONS APPLY REGARDLESS OF LEGAL THEORY, WHETHER BASED ON TORT, STRICT LIABILITY, BREACH OF CONTRACT, BREACH OF WARRANTY OR ANY OTHER LEGAL THEORY, AND WHETHER OR NOT TOPOLOGY WAS ADVISED OF THE POSSIBILITY OF SUCH DAMAGES. No matter where you’re located, the laws of the State of California will govern these Terms and the relationship between you and Topology as if you signed these Terms in California, without regard to California’s conflicts of laws rules. If any provisions of these Terms are inconsistent with any applicable law, those provisions will be superseded and/or modified only to the extent such provisions are inconsistent. The parties agree to submit to the federal or state courts in San Francisco County, San Francisco for exclusive jurisdiction of any dispute arising out of or related to your use of the Services or your breach of these Terms. These Terms constitute the entire agreement between you and Topology and supersede all prior or contemporaneous communications and proposals, whether electronic, oral, or written with respect to these Services. Any rights not expressly granted herein are reserved.